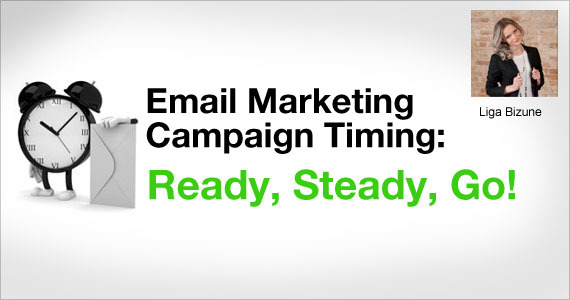 Email Marketing Campaign Timing: Ready, Steady, Go! Before we address the thorny issue of when is the best time to send a marketing email, we need to clarify a couple of terms. Open Rate – if you were to send out 1000 emails, 100 of which bounced, and 120 were opened, the Open Rate would be 13.3% (120/900 multiplied by 100). Why did we do this calculation? Because these two measures are often used to measure the success, or otherwise, of an email campaign. That’s really what this article is all about: Getting the best results for an email marketing campaign by choosing the most advantageous time to send them out. Okay, here’s the secret. There is no “best” time to send out a marketing email. There are only guesses, rules of thumb and received wisdom. Yes, there is a great deal of statistical information lying around but much of it is very general in nature. It can be used as a guide but little more than that. Some of the statistical information concerning when best to send marketing emails includes the fact that less people open email overnight than during the day. So, unless you want to target insomniacs, sending email at night might not be the best option for you. Other revelations include the fact that more email is sent during the working week than on weekends. Hardly surprising when you consider how empty most offices are on a Saturday and a Sunday. The facts are that the peak days for sending email are Tuesday and Thursday. If you’re thinking about the time of day, then most emails are sent between 06:00 and 12:00 with the graveyard shift (00:00 to 06:00) being the quietest time for email sending activity. Most click-throughs occur between 08:00 and 09:00 and 15:00 and 20:00, with the greatest number of email openings occurring between 08:00 and 09:00 and 15:00-16:00. 1. Remember time zones! If you’re hoping to get the attention of business people during the 08:00-09:00 golden hour then sending them an email a few hours too early or late isn’t going to work. Find out where the recipients are located and segment your mailing list accordingly. 2. Send out your emails so that they appear in inboxes no later than 60 minutes before the most popular email opening times (08:00-09:00 and 15:00-16:00). 3. Consider the contrary position. If most emails are sent on a Tuesday or a Thursday then, perhaps, sending your marketing email out on a Monday or a Friday might just get more attention because it isn’t drowned out by the herd. 4. If targeting the B2C market, then the fact that the peak opening rate for email on tablets is 20:00 could be very important to you. An ideal time to slip in your latest offer while the customer is web surfing and watching TV at the same time. But remember, the operative word here is “could.” There are no guarantees in this business. 5. If the content of your marketing email is poor, irrelevant and boring then it’s not going to succeed in its mission. If it’s not targeted properly then it’s not going to get the reaction you desire. The time it’s sent becomes immaterial if the basics haven’t been addressed. You’re better off sending fewer emails, which are properly targeted and produced, at the wrong time than many emails loaded with poor content at the right time. More and more people are accessing email via their smartphone, checking their mail as they rise and just before going to bed. That might mean a marketer wanting to target busy moms, office workers and other early risers could send their messages just before 06:00 in an effort to catch people’s attention before their day has begun. The only way to find out if this, or any other time-based emailing strategy, would work is by trial and error. Takeaway: There is no perfect time for sending marketing emails. Monitor the results of your campaigns and be ready to adapt the content, the design and the timings to ensure you get the best results from your marketing efforts. You’re going to have to experiment with various options before you discover the best time to send out your business’ email campaigns.